When it comes to your Halloween parties, you think hard on the details! It starts at your front door. People are greeted with an eerie wreath or some spooky music before they even knock on the door. Your dining room table is littered with enticing cookie crumb graveyard cupcakes. The lights look like they might need some serious cleaning, faux spider webs hanging from the fixture. 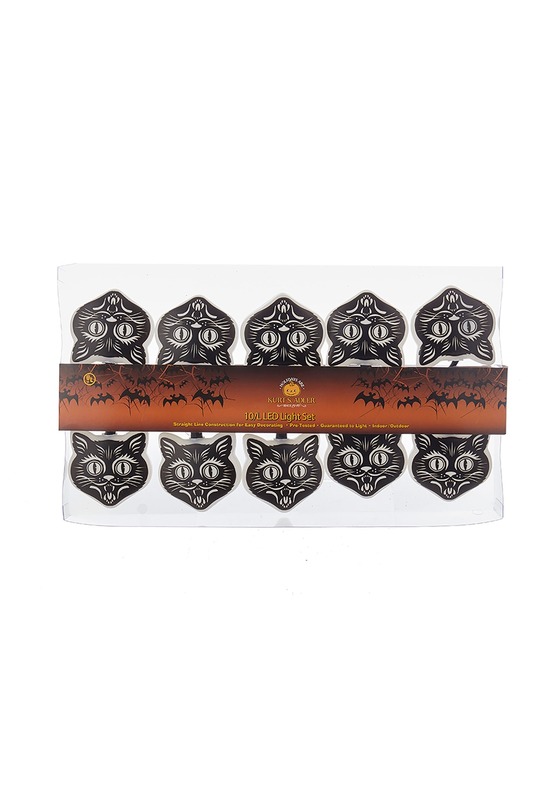 But if you want to bring your true-blue kitty kitsch to light, these spooky black cats are where it's at! These cats are ready to be hung inside or outside! Sling 'em in any nook to add some Halloween lighting, with ten vintage style cat heads glowing on the line, they'll stand out with the perfect spooky touch. If you've got a great line of lights, we won't judge you for jumping on any opportunity to host a couple folks! After all, if you've got great party accessories, you've got to flaunt them. Check out our other awesome Halloween decor to make your little get-together complete. From skeleton cats to eerie candelabras, we have whatever it takes to make your party stand out. Now if only we could try some of those graveyard cupcakes!